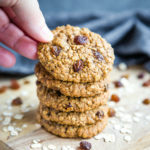 These Soft and Chewy Oatmeal Raisin Cookies are better than grandma's oatmeal cookies - they're sweetened with molasses for an extra chewy cookie! Preheat your oven to 375 degrees Fahrenheit. Prepare baking sheets by lining them with parchment paper. Set aside. In the bowl of your stand mixer fitted with the paddle attachment (or in a large bowl with a hand mixer), cream the butter until smooth. Butter that's been out of the fridge for about half an hour works best for this recipe. If it's too soft and the cookies will spread too much. Add the brown sugar and continue mixing on high speed until the butter is mixed in well. Add the molasses, egg, and vanilla, and mix until smooth. Be sure to scrape down the sides of the bowl to ensure everything is combined. Add the flour, baking powder and baking soda, salt, cinnamon, nutmeg, cloves, ginger, oats and raisins. Mix on low speed just until the flour disappears and everything is well combined. Roll the dough into balls just larger than a tablespoon. Press each ball down onto the baking sheets to form a cookie shape, leaving enough room between the cookies for them to spread slightly. Bake at 375 degrees for about 9 minutes or until the cookies just lose their shine on top. Let them cool on the pans until almost completely cool, and then transfer them to a wire rack to cool completely. Store the cookies in an airtight container, or enjoy them when they're fresh!